Oaks from the forest have been used for building for centuries. Probably, the original St. Mary’s church was built of forest oaks. In 1336, Henry de Edwinstowe, vicar of Edwinstowe, was granted license to take trees from the forest to make a hundred quarters of charcoal. 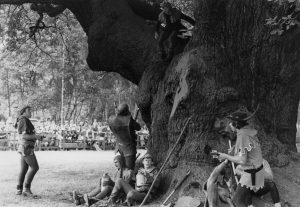 In 1609, a survey listed the oak-trees in Sherwood and 49,909 were found. 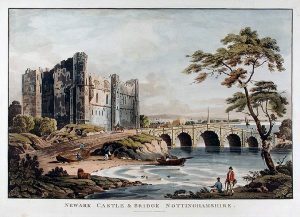 During the Civil War, 1642 – 1651, the Countess of Newcastle, whose husband was Governor of Newark Castle took a large quantity of oaks from the forest to repair the castle. She kept the money for herself and the repairs were not undertaken. With support from the deputy-warden of the forest she then took more timber and they shared the money made between them. 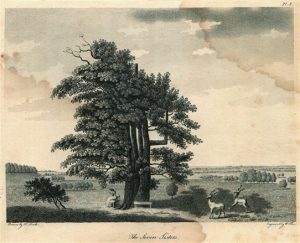 In the 1600s, many oaks were felled for buildings, furniture and ship construction (including Nelson’s fleet), others were lost when land was cleared for farming. Lightning struck the church spire in 1672. 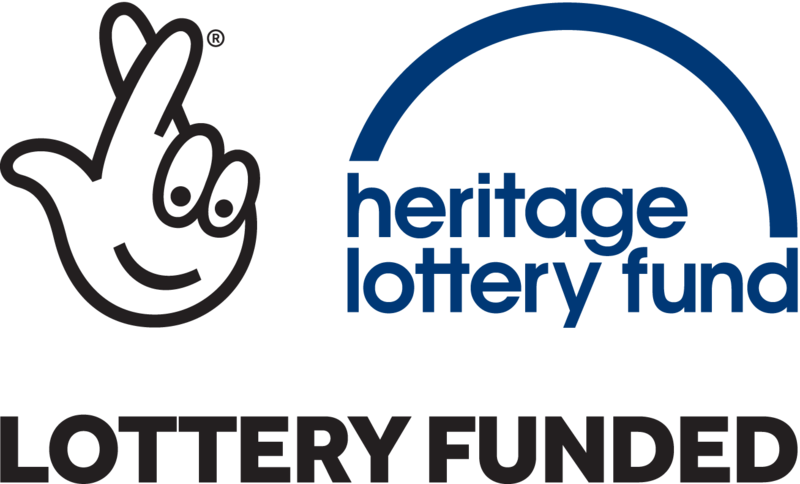 Edwinstowe parishioners petitioned Charles 11 for repairs. He agreed that 200 trees could be felled and sold to cover costs. In, 1790 ten oaks were used for the roof of St. Paul’s Cathedral in London. A survey in the forest, at that time, showed that there were 10,117 oaks remaining. 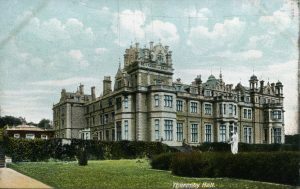 The sale of timber from the forest, during the 18th and 19th century, paid for the palatial buildings and formal gardens of the Dukeries Estates, such as Thoresby, Welbeck, Rufford and Clumber. 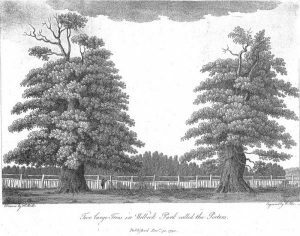 Also, at this time, there was some large-scale plantations as they invested in the future of wood. 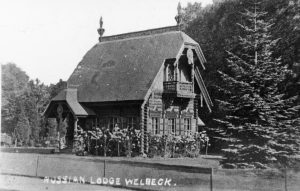 The Duke of Portland in the early 1900s, built a Russian style hunting lodge from Sherwood oak logs. Oak has been used for many timber framed buildings as well as the roofs of many cathedrals and churches. Over the centuries, resources from the forest have supported everyday life. 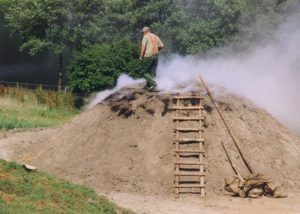 Brushwood and twigs from silver birch and other trees were used for domestic fuel and charcoal burning. 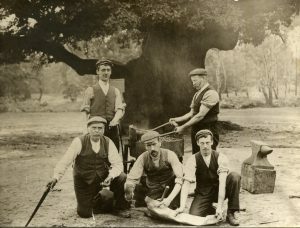 Landowners used techniques such as ‘coppicing’ and ‘pollarding‘ to produce poles, canes and lathes for building and crafts. 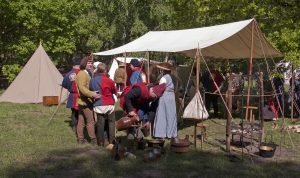 Pigs were fed acorns and the oak of bark was used for leather tanning. Cattle and deer still graze in the open forest areas and the berries on the holly bushes provide winter food. Today, 2017, wood from Sherwood Forest is still being used. Launay’s Restaurant, Church Street, Edwinstowe is to have a new bar and table tops made from recycled wood. In celebration of the Army no longer using the forest as a training ground this plaque was placed on Forest Corner. 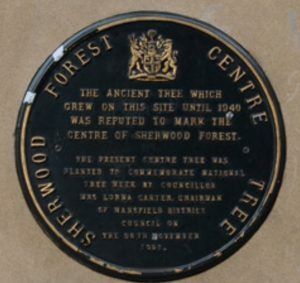 In commemoration of the establishment of the Sherwood Forest Park and the part played by C.C. 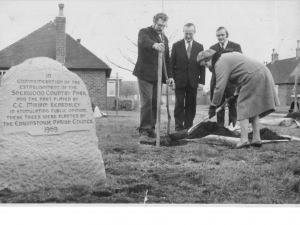 Miriam Beardsley in stimulating public opinion these trees were planted by the Edwinstowe Parish Council 1969. The Major Oak is an English or pedunculate oak and stands in the heart of the present forest. 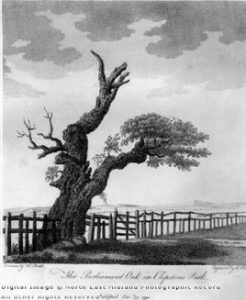 It has three names, ‘The Major Oak’ (named after a local historian, Major Rooke in 1790), ‘The Queen Oak’, a C18th name and ‘The Cockpen Tree’ as it was used by locals as a pen to hold cockerels before a cockfight. More recent measurement estimate that the oak is about 23 tons with a girth of 10m (33feet) and a spread of 28m (92feet) making it the largest oak tree in the UK. Its age is debatable and possibly ranges from between 800-1,000 years. Most oak trees take 300 years to grow, 300 to live and 300 years to die. This is why it possibly needs wooden poles to help support its branches. The hollow trunk is formed by fungi. There are just over 1,000 ancient oak trees remaining now. 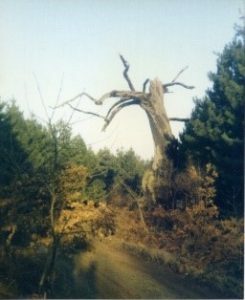 However, it has to be remembered that an old dying oak tree sustains a vast number of wild-life, including some of Europe’s rarest invertebrates, some unique to Sherwood. 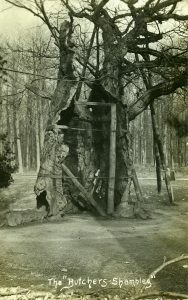 The Major Oak showing the opening in the trunk and the lead, now removed, which was added to support the tree. 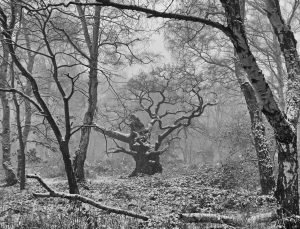 In 2002, Sherwood Forest was designated as a National Nature reserve with SSSI status (Site of Special Scientific Interest). 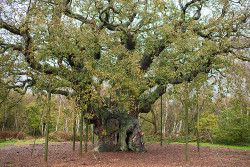 In 2014, the Major Oak was crowned ‘England’s Tree of the Year’ via a public poll by the Woodland Trust. Today, slim steel poles support the sprawling branches of this famous, well-loved oak. This was a remarkable tree as its trunk resembled a spinal column with a strong base and immense roots which many believed gave it boundless strength. A man from Edwinstowe, Simon Foster, used it to secure his stock under the tree during the night for protection, and from that time it has borne his name. He is buried in St. Mary’s graveyard. 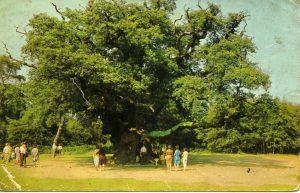 The Shambles Oak was a large hollow tree which used to stand about half a mile west from the Centre Tree near the Black Pool. 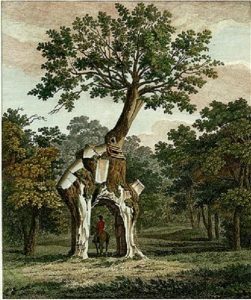 The tree had hooks on the inside of its trunk and legend says it was a store for Robin Hood’s venison. It was set on fire by picknickers in 1913 and in 1962 was blown down. 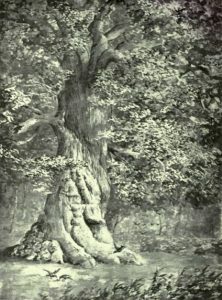 Close by on the Broad Drive is the Centre Tree so named as it is reputed to be at the centre of Sherwood Forest. 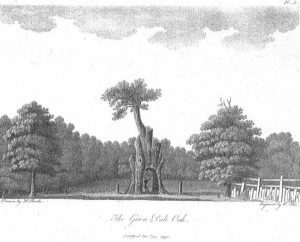 The Greendale Oak used to stand in Welbeck Park. The gap in the trunk was wide enough to allow a coach and horses to go through. Supposedly, the 1st Duke of Portland won an after-dinner bet after he drove a coach and six horses right through it. The story also adds that he used a miniature coach. However, after the tree had been hollowed out it sadly died. 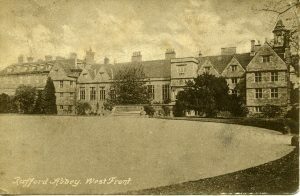 It is said that Countess of Welbeck Abbey then had furniture made from its branches. 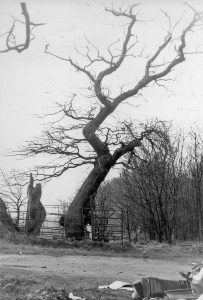 Parliament Oak still stands beside the A6075 between Mansfield and Edwinstowe. The tree survives as an offshoot from the trunk of the original tree. Legend says that in 1212, the king, Edward 1, whilst hunting from King John’s Palace in Clipstone was told of a revolt among the Welsh so he hastily held a parliament under this tree. 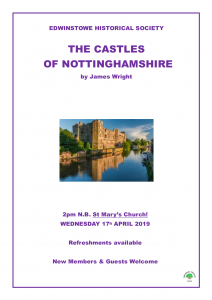 They decided that 28 Welsh hostages being held in Nottingham Castle would be executed as an example. The Parliament Oak was on England’s tree of the year shortlist for 2017. The Seven Sisters was so called as it had seven stems rising from the main trunk. Major Rooke, in 1790, measured its height as 88feet with a circumference of 34 feet. 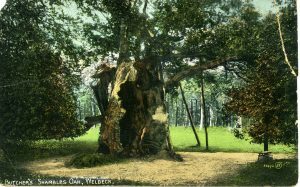 The loss of many ancient oaks from the forest is sad, but there are records that show that a tall oak with no branches called, ‘The Duke’s Walking Stick’ was self-seeded and produced a ‘Young Walking Stick’. Many acorns were also collected and given to his friends to plant. 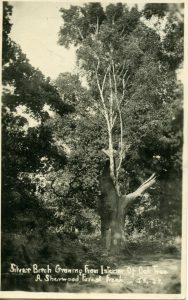 The original tree, recorded by Major Rooke, was 111ft 6ins high and he calculated its weight as 11 tons. 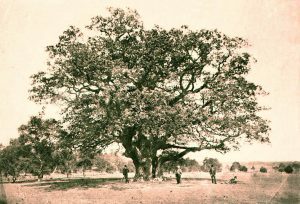 The Porter Oak name came from having been a gate erected between the two oaks. Major Rooke, in 1790, measured it as 98 feet tall with a circumference of 38 feet. The Cuckoo Birch was a birch tree that grew out of the trunk of an old dying oak tree. It was situated on the path close to the Open Air Theatre.